Water sight glasses in our model steam engines have many limitations and are often inaccurate and difficult to read and the train always has to be stopped to take a reading. This Water Level Detection System senses when the water in a boiler approaches a low level and is in danger of damaging the boiler by changing the normally Green LED to Red. Then water can be added through a Goodall valve. Also an Electric Water Pump can be controlled to automatically add water as determined by the Sensor Circuit. When an axle pump is used, a solenoid valve in the bypass is activated when the System senses need for water to maintain water in the boiler. Faster “steam up time” no need to completely fill the boiler initially. In boats, water level can be monitored "from the shore”. The miniaturized system is easy to install. An on/off switch and an adjustable continuing pump control are included to prevent excessive pump cycling. The system is easily installed in a locomotive tender or steamboat. 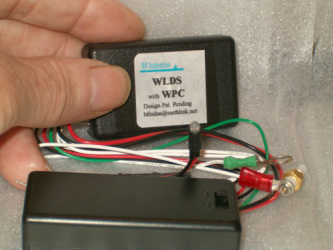 A complete set of instructions, including the easy installation of the probe into the boiler, is included. For installation in Accucraft Locomotives that have a mounted sight glass in line with the top of the flue, a special probe and plug is available which replaces the sight glass and eliminates the need to drill a hole in the boiler. Therefore no permanent alterations to the boiler are required.